Hi there, i am turning 16 soon and I was wondering if it was too late to start? Also, I'm quite a muscly build (I'm a girl by the way) and a bit on the heavy side, I am doing a plan for this year to loose a bit of weight but am I still to large even if I'm only doing ballet for a hobby? (I'm 65kg)..
To:- Career Development Plan - Is it too late? In terms of a hobby, I would say it definitely is not too late to start ballet. Many people of all ages have turned to ballet as an enjoyable and rewarding form of exercise. It may prove harder to fulfill a career in ballet, as most professional dancers began training at an earlier age. However, renowned choreographers such as Frederick Ashton and Matthew Bourne both began dance training at a later age and still managed to pursue a successful career within the dance world. So you never know what beginning ballet could lead into the future. If you are planning to loose a bit of weight, then make sure you remain sensible through a balanced diet and variety of exercise. I find swimming is a great form of aerobic exercise which can effectively slim down the body. I expect that once you begin ballet, you will see your body lengthen out as it tones the body whilst making it supple and lean. 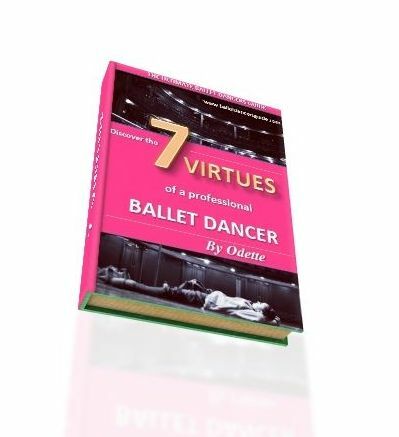 Don't forget to follow the Seven Secrets, on the 'Seven Secrets of Ballet' page, which will give you the key answers of how to thrive in the ballet world.